With previous experience working for two national housebuilders, based in North Kent, and an East Kent Local Planning Authority – I bring over a decade of experience working throughout Kent. I was brought up near to Ashford, and living locally means that I have an extensive knowledge of the local area. The team here at Hobbs Parker is extremely talented and friendly, and we cover a broad range of sites, from small-scale development through to large-scale mixed use developments. 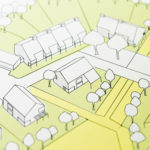 We not only prepare and submit planning applications but also make representations to Local Plans, meaning that we take sites forward from ‘empty’ fields all the way through to when construction starts onsite. I have a particular interest in promoting sites through the local plan making process, having previously worked as a Senior Policy Planner for five years. I enjoy assessing the development potential of new sites, especially on cases which are not clear-cut and where there is a need to challenge policies in order to achieve a favourable outcome. Hobbs Parker has been established since 1850, and although many clients are agricultural based, the planning team here deal with a variety of different projects including large-scale residential schemes, retail projects, commercial units and all other types of planning work. Outside of work much of my time is taken up with my young family, however, when I get time I enjoy walking in the countryside and gardening.